AMERICA/URUGUAY - The Bishop of San José de Mayo: "a pastoral reconfiguration to put everything we are and we have at the service of the mission"
San José de Mayo (Agenzia Fides) - "Speaking of pastoral reconfiguration means putting Christ at the center of our lives and our activities. The purpose of pastoral reconfiguration is to put who we are and what we have at the service of the mission": says the Bishop of San José de Mayo, Mgr. Arturo Fajardo, in his Lenten pastoral letter entitled "Effatà, open yourself up - Towards a pastoral reconfiguration". In the document the Bishop, after 11 years of service at the head of this local Church, reviews the activities of the Diocese and launches the proposal to "put everything in the key of the mission", proposing the concept of "pastoral reconfiguration". The text is divided into 8 parts. 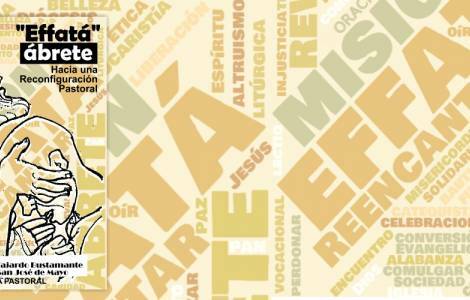 After the introduction there are six chapters which follow and a conclusion: a reality that challenges us; a text to meditate, an image to contemplate; the encounter with Jesus Christ starting from the Word; the Church of San José and Flores: put everything at the service of the mission. The Bishop points out "a possible path to redirect, to find a common path in the line of pastoral conversion, a return to the essential, trying to purify those structures that are obsolete. It is about reconfiguring the diocesan life with its riches and fragility, to put everything at the service of the mission", giving continuity to the Diocesan Mission project, inspired by the popular Missions that took place from 2014 to 2018. "The Church exists for the mission, moreover, the Church does not have a mission, but the mission has a Church", underlines the Bishop, on the "reason for being of the Church". Mgr. Fajardo points out some diocesan realities linked to evangelization. For the "first announcement" it is necessary to bet on a correct and appropriate use of the mass media. Social networks, despite the negative effects of their inadequate use, "constitute a space in which both adults and young people channel many of their research and forms of relationships". As regards to catechesis, it is necessary to recreate a diocesan team that deals with the initial and permanent formation of catechists, to give catechesis a "discipleship" character. It is essential to think of a catechesis "that is not to receive the sacraments, but to integrate into the Christian community". The presence of Catholic educators in public education "is a treasure", "even Catholic schools are places of evangelization", he emphasizes. It will then be necessary to coordinate youth pastoral with the pastoral care of vocations, enhancing the diversity of vocations that exist in the Church. The emergence of vocations engaged in different ministries and services is also a challenge "to accompany new vocations in the difficult and complex moment we are experiencing". Finally, the Bishop emphasizes the great wealth of social service in various sectors: children, families, canteens, health facilities, the elderly, the sick ... Some services are provided in agreement with the State, others are managed by the diocese.